geosynthetics for building and construction, geotechnics, home and garden, hobby, some industrial applications. I think the first project that the wickdrains have been used was in Belgium, in the Brussels Metropolitan Transport system. The second may be the Eskisehir light rail tram system. Actually the main application of PVD's are in soil consolidation. But in this tram project it was used to collect the leakage water to prevent not to pass the lower section to cause rusting. So, if it is a good drainage material and if it works also horizontally why not we use horizontally. 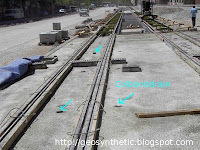 Colbondrain (a Dutch made PVD from Colbond geosynthetics bv.) was laid horizontally, and to collect more water they made some loops upwards. The information set forth in this blog reflects our best knowledge at the time of issue(post). The information may subject to change. We undertake no liability for results obtained by usage of information in this blog. No part of the blog can be used or printed in websites or else without taking our confirmation. This blog contains only general information and we are not responsible of usage of any information in this blog.